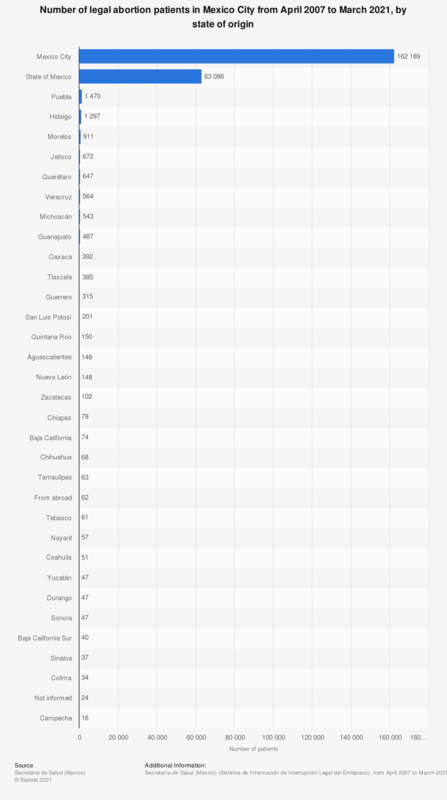 This statistic shows the number of legal abortions reported in Mexico between April 2007 and March 2019, sorted by residence of the person involved. Mexico City is the only jurisdiction in the country where abortion can be performed legally up to the first twelve weeks of pregnancy. In the indicated period, a total of 209,353 legal abortions were performed in the Latin American country, out of which 146,110 were women who resided in the capital city, whereas nearly 55,230 came from the state of Mexico. In April 2007, Mexico City became the only jurisdiction in Mexico where abortion was decriminalized. However, this must be done within the first twelve weeks of pregnancy, otherwise it is considered a crime.